Fishingmag editor Allan Burgess with a typical salmon caught spin fishing at Canterbury’s Lake Coleridge. 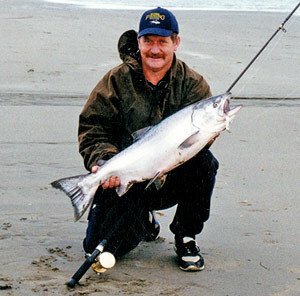 Fishingmag.co.nz is a New Zealand fishing website based in Christchurch. It was started by Allan Burgess in 1999. We have a massive resource of fishing articles about fresh and saltwater fishing places, including fishing tackle and methods. We also have a popular online fishing forum with over 1,200 members and 19,000 plus posts. In April of 2015, the site underwent a major upgrade. Our mission is to inform, educate and entertain anglers fishing anywhere in New Zealand and around the world. Fishingmag.co.nz was founded by Allan Burgess in 1999. On our website, you will learn about Trout Fly & Spin Fishing, Salmon Fishing, Surfcasting, and Sea Fishing in New Zealand. We have a huge resource of places to fish, tackle, and fish species. Allan Burgess, salmon at the Waimakariri River Mouth. Fishingmag.co.nz is a guide to New Zealand fishing. It covers the best fishing locations, fish species, surfcasting, trout and salmon flies, soft-baits, sinkers, hooks, rigs, and many how-to articles about things like smoking fish and making sinkers. We cover trout, salmon, and sea fishing. Boat fishing, rock fishing, lake and river fishing, as well as surfcasting. Our fishing forums contain over 19,000 posts. We have also created a fishingmag.co.nz mobile website that includes the latest mobile web technology for iPhone and Andriod in the form of Google’s Accelerated Mobile Pages project. It is really fast too! You can easily upload photos to the forum from your phone or tablet – the forum isn’t AMP. You can even save fishingmag.co.nz as a web app on your iOS device. A special word of thanks to the many anglers, writers, photographers, computer experts, and other contributors who have helped to make this site possible. Don’t forget to join up for our email newsletter using the forms on the right-hand side of most pages, including this one. We’ll send you information every fortnight about the latest articles on our site, fishing news, free .pdf fishing books and booklets, and more. Adding your name really makes a difference! We welcome you to our website and invite you to contribute to our pages either as a forum member, or by sending in pictures, fishing stories, and info to be enjoyed by anglers everywhere. If there is something we can help you with or something you would like to see on our site, or in our newsletters, please don’t hesitate to send us a message. We appreciate your feedback. It helps us to improve the way we help you! Our aim is to make fishingmag.co.nz the best fishing website we possibly can!